Everyday a new question will be answered. You can send us your questions as well and win a prize. Winning Question: On Mars the color “Red/Orange” is predominant. Will astronauts desire for differnent colors after some time or will they be given pictures, things against “homesickness”? This question was sent in by Andreas Egger and was selected as winning questions. Therefore the field crew answered this question (English starts at 1:18 min). Congratulations! How do you manage such a complex mission? Did you have any support from professionals? Imagine you had to coordinate more than 100 people in two different locations which are 100km in distance and 2.000m in sea level apart. This is what is happening every day during our AMADEE-15 Mars simulation. There are several reasons for this to succeed: First off, AMADEE-15 is not the first Mars simulation that we conduct. During the missions since 2006, we have gained a great amount of experience that we can draw on. The application of this knowledge reflects in almost every aspect of the mission. We also exchange our findings with our colleagues from NASA and ESA and publish scientific papers which in turn gives us new input. 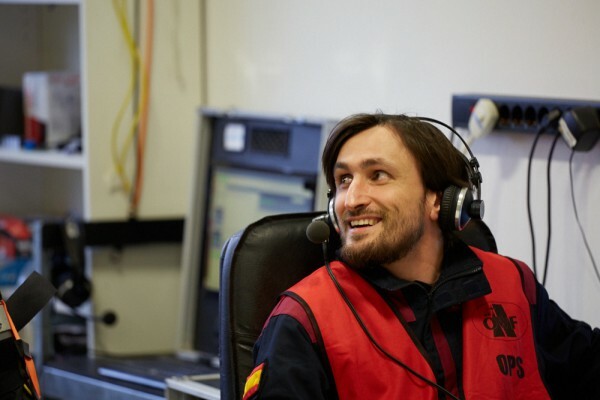 During AMADEE15, there are several teams: The field crew, the flight control team (FCT), the remote science support, the flight plan team, the media team, and many more. Every team takes care of their tasks and shares their results with everyone else during the daily briefings. That way, everyone knows what is happening in the individual teams. In addition, the team leaders meet for a pool party every evening, which might sounds really cool, but is simply a euphemism for the daily management meeting. Coordination is facilitated by the fact that all participants of the mission are volunteers. Everyone is driven by their intrinsic passion for space flight and space exploration and gives it their all during the mission. Each of the participants brings individual expert knowledge, be it from engineering, IT, biology, media, and many more, which they acquired during the studies or their professional career. This way, everyone can rely on each other and be sure that all tasks will be executed in a proper manner. Even though the size and the complexity of the mission might appear like a logistical nightmare, it is nonetheless achievable thanks to a great professional team and our industrial partners. And wouldn’t the mission be boring without a challenge? Which devices will future astronauts use on Mars? Until now, plans for a manned Mars mission only exist on the drawing boards of NASA, ESA, etc. But two things are certain already: First, astronauts will work very autonomously. The large distance between Earth and Mars causes the communication to be delayed by several minutes, which means that astronauts will not be able receive much help from the mission control center. And second, they will have to pack lightly because every piece of material requires more fuel to be added, which is extremely expensive. 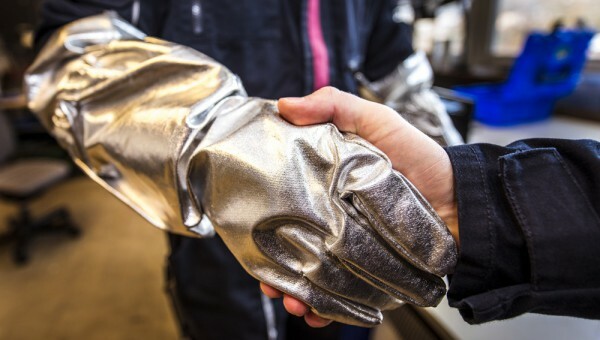 A creative idea to circumvent this problem are 3D printers, which allow astronauts to produce the tools they need directly on Mars, using the planet’s own materials. AMADEE-15 is also exploring such a 3D printer. The tools which will be used by astronauts on a future mission to Mars have not been decided yet because that would depend on the mission’s goal and the current state of technology. But it will probably include rovers which would have been sent in advance already. 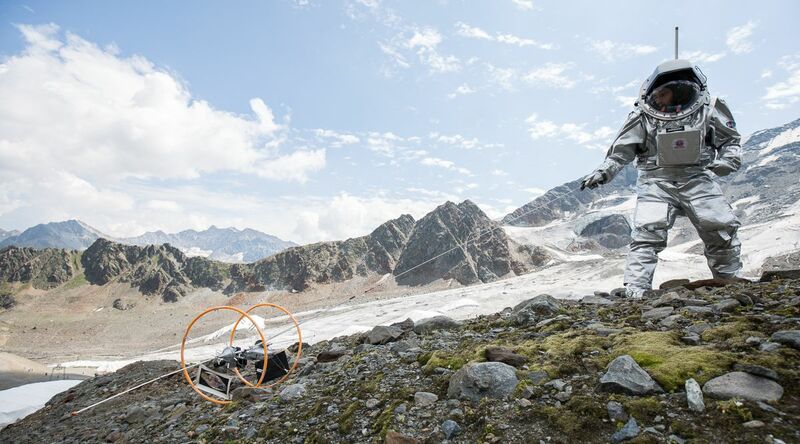 Two such rovers will be tested during AMADEE-15: The ‘Cliff Reconnaissance Vehicle (CRV)’ by the French ‘Planète Mars Association’ and the Hungarian ‘Google Lunar X PRIZE (GLXP)’ rover by ‘Puli Space Technologies’. There might not be an exact schedule for a manned Mars mission yet, but this is exactly why AMADEE-15 is so important: Only by exploring the unknown are we able to move forward. AMADEE-15 can help us to find out which tools can be used on Mars and which cannot. In doing so, the mission marks an important step on our way towards the red planet. Is there life on Mars and if yes, how could it be detected? That is the million-dollar question. Scientists focus their search on small life forms like microbes. On Earth, we see them survive and even thrive in all kinds of extreme environments. These microbes live, for instance, in the deep seas where pressure is very high and there is no light. The environment on Mars seems to resemble some extremes we see on Earth and since we know that microbes tend to survive in harsh conditions, we expect to find life most likely in the form of microbes. The branch of science that studies potential extraterrestrial life is called astrobiology. During the mission, two astrobiological experiments will be conducted: L.I.F.E. (Laser-Induced Fluorescence Emission) and MASE. The first one is a portable laser system which detects and quantifies biomarker molecules in extreme environments without touching or destroying the sample. This method has only been in use as of recently and the analog astronauts will be able to identify microbial life with the L.I.F.E. device. The MASE experiment detects special biomolecules. Their presence is generally evaluated as proof for life. By applying the most modern molecular methods, more information about these microbial survival experts can be gained. 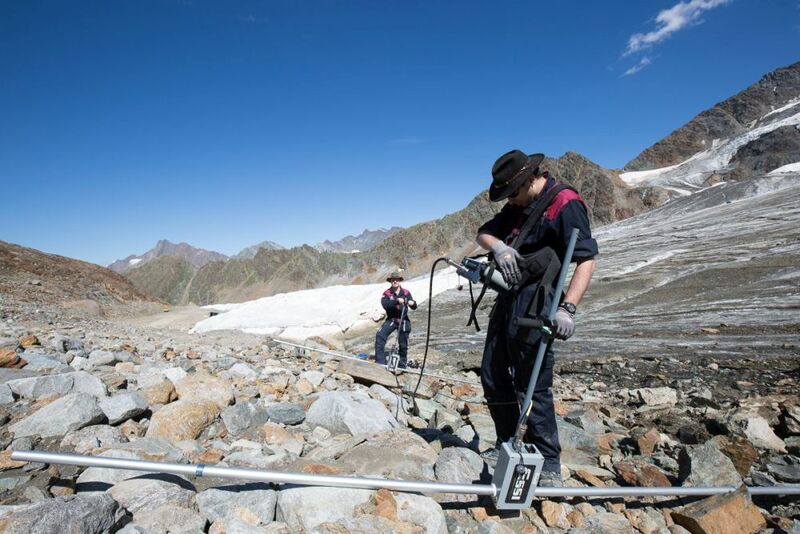 The conditions at the Kaunertal glacier allow scientists to take samples in a Mars-like environment and to conduct experiments which can detect life. The question then is whether these microorganisms at the glacier can survive under similar conditions as on Mars or other celestial bodies. MASE wants to add a new puzzle piece to one of the most important questions of modern science: Are we alone or is there other life in the universe? Why is your suit called “Aouda”? Could it be used on Mars? The name comes from the famous science fiction novel ‘Around the world in 80 days’ from Jules Verne. In this novel, Phileas Fogg accepts a wager to travel around the world in 80 days. This should be possible because of the opening of a new railway section in India. Phileas leaves London with his valet Jean Passepartout. During their travels, they rescue a young Indian princess called Aouda. In order to save her, they bring her along on their journey. In the end, Fogg and Passepartout win the wager and Fogg marries Aouda. This novel was inspiration for the Mars analog research program of the Austrian Space Forum and that is why the rover is called Phileas, the balloon is called Passepartout and the suits are called Aouda. What will happen in Innsbruck during the mission? AMADEE-15 will take place at the Kaunertaler glacier – but this does not mean that all people involved in the mission will be present there. Just like during NASA or ESA mission, most team members are not sitting in the ‘space craft’ but rather in front of computer screens in control centers like those in Houston (NASA) or Darmstadt (ESA). 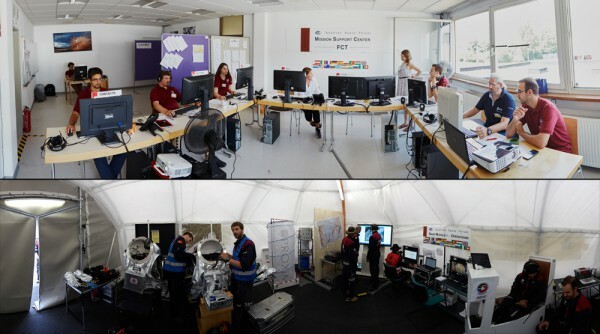 Since our simulation is supposed to be as realistic as possible, we too have a mission support center (MSC) in Innsbruck. The MSC supports the simulation on the glacier and is in a constant contact with the field crew on ‘Mars’. It receives updates from the field, can change the flight plan and can assist the astronauts when they are working in the field. One special aspect of AMADEE-15 is the communication delay: Since Mars and Earth are very far apart (on from 55 up t0 401 million km), communication signals which travel at the speed of light take several minutes to reach either planet. This complicates the communication between the MSC and the field crew and therefore has to be tested for future manned Mars missions. This is why AMADEE-15 will use a 10-minute delay for the communication. And besides the communication aspect, there are many additional tasks to care of: The analog astronauts rely on the support of the scientists on Earth to properly conduct their experiments. All activities need to be planned and their execution monitored. The mission needs to be communicated to the public. And there is much more…. You see: Even in Innsbruck, there is a lot to do. And if one thing is certain, then it is that we will not get bored! How will astronauts be able to explore Martian glaciers without drilling tools? Mapping the internal structure of Martian glaciers without damaging their surface is the aim of the GPRoG experiment (Ground Penetrating Radar on Glaciers), which will be ran during AMADEE-15 by Alexandra Zavitsanou from the University of Athens, as well as Pradyumna Nanda Vyshnav and Oscar Kamps. The experiment will feature a GPR device which emits electromagnetic waves into the ground using a transmitter antenna. These waves are reflected by interfaces separating mediums of different electrical properties. They will be received by an antenna and then displayed in a control unit as 2-D profiles of the glacier subsurface structure. Using GPRoG on Mars can be useful in several ways: It is strongly related to water exploration since it is able to detect stored water ice as well as the possibility of past life. In order to deploy such an equipment during future manned Mars missions, the GPRoG experiment at AMADEE-15 will explore whether GPR can be operated smoothly in a space suit. Until that point, we have to rely on unmanned missions to explore the geology of Mars, such as ESA’s ExoMars mission scheduled for 2018. Will there be enough water to take a shower on Mars? Even on Mars, you need to take a shower once in a while. The problem is: Water is a scarce resource. Scientists have already been working for a long time on possibilities to use water on Mars in an efficient manner. One idea is to recycle water from urine, but even these methods will not prevent water shortage because humans use a very large amount of water in their daily lives. 127 liters – this is the amount of water an average human needs on a daily basis. Out of that, 44 liters are used for showering. But for the long journey to Mars, it is impossible to bring such a large amount on a ship. This is why during AMADEE-15, we want to explore how to use this resource as efficient as possible. This is where the FOG-experiment comes in. FOG is a foldable shower using water fog. This allows for a consumption of 4.5 liters during a 10 minute shower – a tenth of the amount we usually use. The goal is to be able to use the model in microgravity. And maybe, the shower can also be used here on Earth in places where water is scarce. How can the gravity of Mars be simulated on Earth? Even the ÖWF has to abide the laws of nature – which is why we cannot simply turn off gravity. Instead, we came up with many ways to get around this problem and still be able to simulate the existing conditions of the red planet. On Mars, gravity is only a third of the strength on Earth – which means that an object on our planet will weigh three times as much as it would on Mars. This is what we kept in mind when developing our Aouda suits. 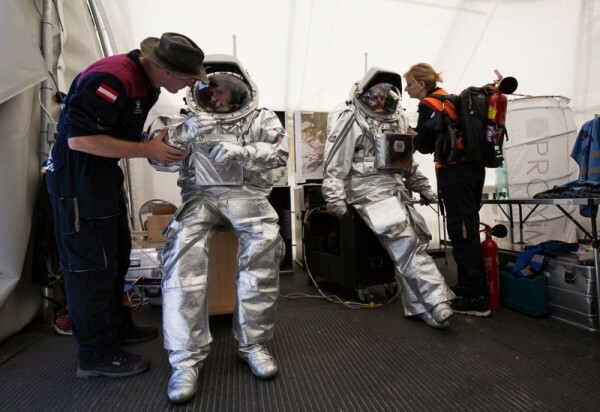 Experts assume that a space suit which will be used for future manned Mars mission will weigh roughly 120-140 kg. So as a result, the Aouda suit weighs 45 kg – which is only a third of the weight. 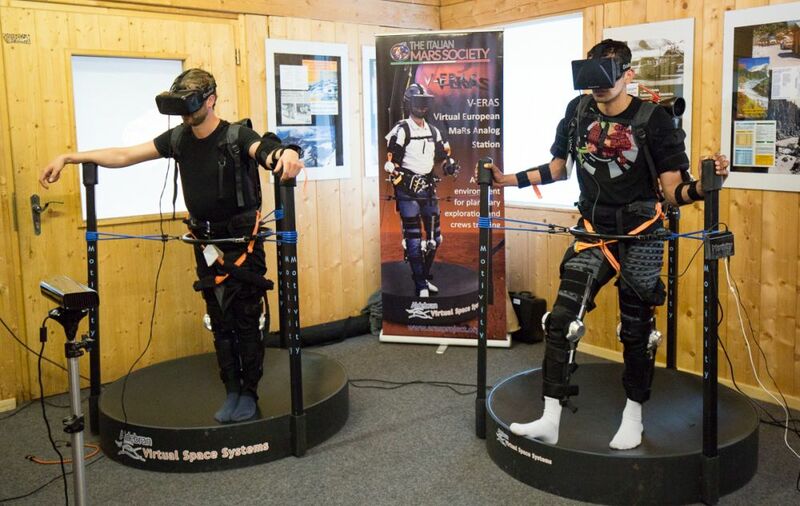 Another way to include Mars’ gravity is through virtual reality. This is what the experiment “VEMES” is all about. It simulates a Mars environment and habitat, in which procedures and experiments can be tested. During AMADEE-15, a prototype of this 3D-virtual-reality-station will be used to find out whether the design of a real Mars station could be further improved. The simulation station can also explore in which way virtual realities can contribute to preparing a real Mars mission. Astronauts would have the possibility to train and move in a Mars environment without actually being there – an enormous help on our way towards the red planet. Are Earth and Mars geologically similar? Mars has an outer crust, a mantel beneath it and a hot core in its interior. Its surface is marked by fissures and furrows which were long believed to be channels created by Martians. But various orbiters from NASA have shown these to be dried-out river beds – which means that a vast amount of liquid water must have existed there in the past. Just like Earth, Mars’ poles are covered by giant ice caps. They consist partly of permanently frozen water ice, and partly of sublimatable dry ice which changes its state through the seasons. On the northern half of the planet, there are volcanoes which have actively shaped Mars’ surface in the past. The tallest of them, Olympus Mons, has a height of 27 km, which is three times that of Mount Everest. It covers an area of 600km in diameter, which is more than the distance between Innsbruck and Vienna. More than 95% of Mars’ atmosphere is made up of carbon dioxide (CO2), a concentration that is comparable to Venus. Mars does not experience a greenhouse effect as intense as on Venus, which would otherwise raise its temperatures above 400 Degrees Celsius. This is because the Mars atmosphere is very thin and therefore has only little influence on temperatures. In addition, it creates little pressure, so astronauts will never be able to walk on Mars without a spacesuit. Compared to Earth, Mars has no dipole magnetic field, which means its surface is not protected from deadly radiation coming from space. On Earth and even aboard the International Space Station, we do not have to worry about this. But for a manned Mars mission, this poses a great problem which has to be solved before sending the first astronauts towards the red planet. In the end, even though Mars is a foreign and unique planet, it is in many ways comparable to Earth. This makes its exploration even more exciting and important. By studying the geological features of Mars, we can draw conclusions to our own planet and answer questions which are yet unsolved. This is why AMADEE-15 will include a variety of geological experiments. And maybe, one day, that will lead us to answer the most important question of all: Are we alone, or is there other life in our universe? Which experiments will be conducted and who will execute them? The challenges of a manned Mars mission are manifold – and so are the experiments of AMADEE-15. How can the human body be kept alive in a hostile environment? This is why we test the space suits. How can inaccessible areas be explored without putting the astronauts in danger? This is why we test the rovers. What do we actually have to look for if we want to find life on Mars, and how can we detect it? This is the question which a variety of biological experiments will explore. And this is by far not everything yet. But we will not conduct all of these experiments on our own – that would be boring. There are many other curious scientists who have their own ideas of what has yet to be tested before sending people to Mars. This is why we invited partners from various universities and private organizations to join us. And these are not only people from Austria, but also from Germany, France, Greece, Italy, Poland and Hungary. 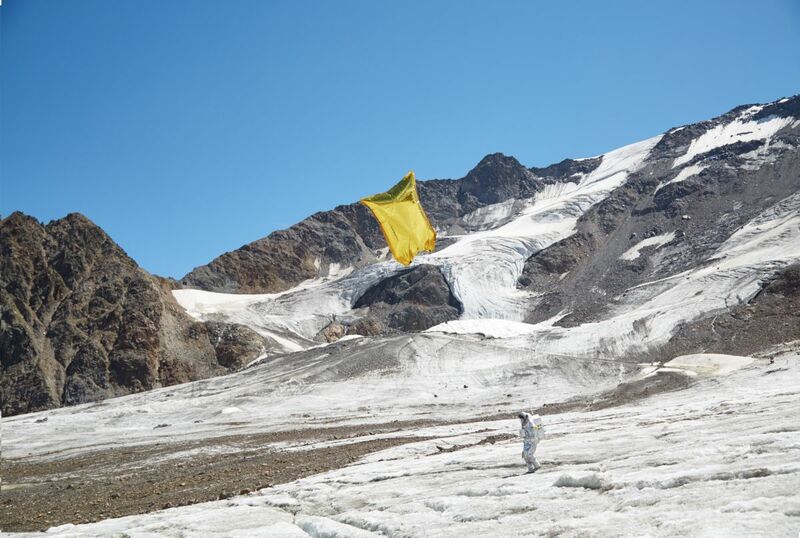 Why did you choose the Kaunertal glacier for #AMADEE15 and will we learn something of the glacier through the mission? AMADEE-15 is not the first Mars simulation by the Austrian Space Forum (OeWF). In the past, we have been to the Northern Sahara in Morocco, to the giant ice caves in the Dachstein region in Austria, to the Rio Tinto region in Southern Spain and to the Moab desert in the US. Most of the time, these are dry and dusty desert-like places like one would find them a lot on Mars. But the red planet is not as monotonous as one might believe. Various probes and rovers on Mars change our picture of it almost on a daily basis. For a couple of years now, we do know that there are glaciers on Mars. 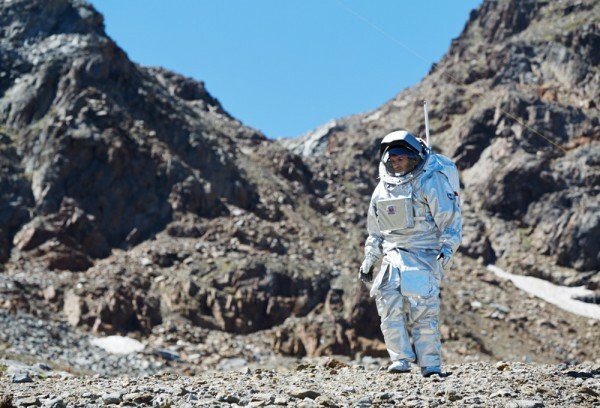 But there has never been a Mars simulation at a glacier before. And even though they do not offer the perfect landing site for future manned Mars missions, they are interesting nonetheless. Because the glaciers found on Mars hold the greatest amount of water ice outside its poles – and therefore count as a possible candidate to find life on Mars. 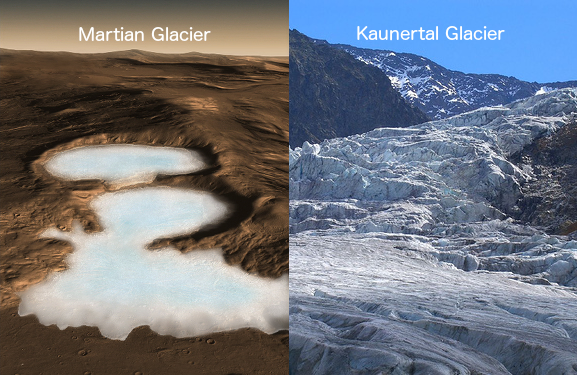 The Kaunertaler glacier is in many ways comparable to the glaciers on the red planet. This is because parts of the glacier are covered by a protective rock layer. This means that the experiments conducted during AMADEE-15 can offer realistic results. And in the meantime, the glacier will be explored as well. The L.I.F.E. experiment, for example, is testing how life can persist in extreme environments which might tell us something about possible life on Mars. But at the same time, it also helps us to understand how life can exist in extreme environments on our own planet. So you see: The Kaunertaler glacier offers an ideal environment to conduct a Mars simulation, and at the same time represents a new setting that has never been used before. This is why we are very excited about the upcoming two weeks, and we hope that you are as well! 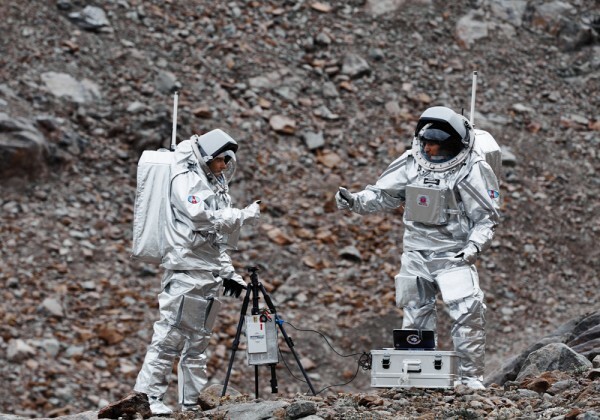 What is an analog astronaut and can anyone apply to become one? 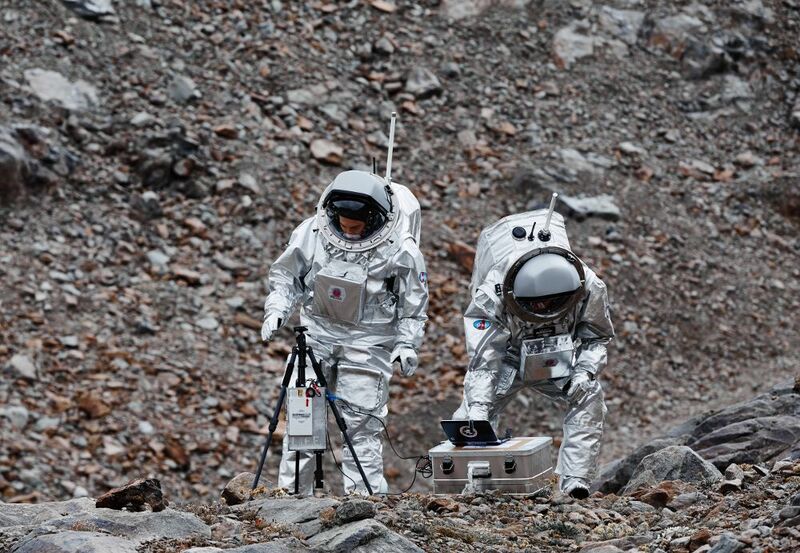 AMADEE-15 wouldn´t be the same without its analog astronauts. 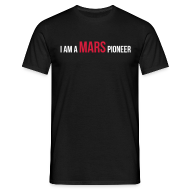 Eight Mars pioneers, including one woman, explore what a long term presence on Mars could look like. Anyone can apply to become an analog astronaut, but they all have to undergo a tough selection process which includes physical and mental tests. For example, psychologists test the candidate’s abilities to withstand stress or isolation. Finally, the selected team members have to match as a crew. Recently such a selection took place. When the candidates are finally selected, the basic training starts. The analog astronauts learn about the spacesuit simulator, experiments and the work flow of a typical mission. Then follows the specialization for a real mission. Each day has its schedule and is planned to the smallest details. 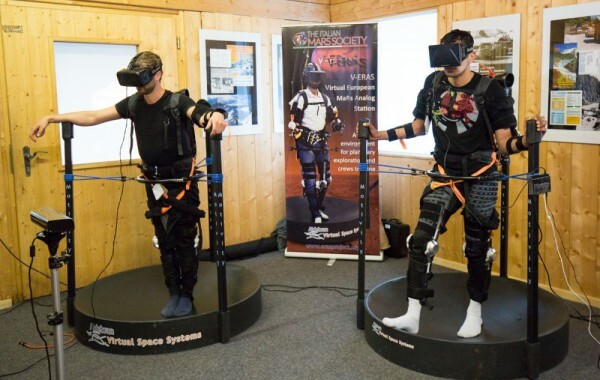 Here the analog astronauts can apply the experience they gained during their basic training and can demonstrate their ability to work together well. Analog astronauts do a lot of public relations activities. They hold presentations in front of classrooms and space enthusiasts and also communicate their work via social media platforms. Even though our Mars missions take place on Earth, it is still of the greatest importance to select the right people. The human factor is still the most important of all in a manned spaceflight. Why are Mars analog missions like #AMADEE15 conducted? Haven´t we already learned enough through manned missions like Apollo, MIR and ISS? A journey to Mars, which entails many risks, must be planned with great care. Selecting the right people to send there is the first step. On missions, such as those going to ISS or MIR, many factors are not relevant that matter on a journey to Mars, for example time delay in communication. When coming from Mars it can take up to 20 minutes before the message arrives on Earth. AMADEE-15 simulates this factor as each message, from the Mission Support Center or from the field, is delayed by 10 minutes. We try to answer questions like: How can we communicate with as much comprehensible information as possible in a single message? Many experiments, such as the L.I.F.E experiment, not only serve the simulation itself but actually help explore the glacier where we conduct the mission. Such data can help us understand how small forms of life can survive in such a hostile environment. The more we practice conducting a Mars mission here on Earth, the better we can know where troubles could emerge and the better we can prepare astronauts for such a journey.